When the reconstruction of the city center was mostly completed in the 1980s, there was still a space remaining between the pre-war buildings and the new office buildings on the Kruisplein. 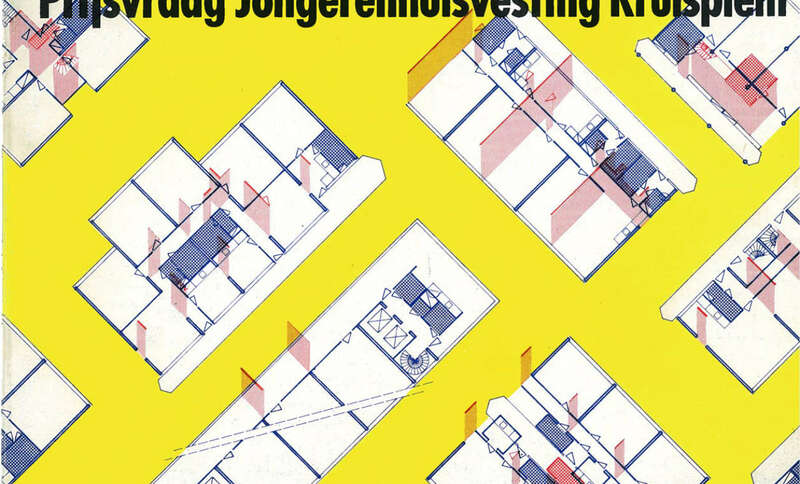 The Aktiegroep Oude Westen presented the 'Anders Wonen' competition, especially for the development of new housing types for people who did not want to live in a family setting. Francine Houben, Henk Döll and Roelf Steenhuis were still students when they won the competition with 196 submissions. This collaboration resulted in the start of Mecanoo Architects in 1984, an architecture office that has realized projects worldwide in the meantime. The design for the Kruisplein consists of two modern residential buildings, a curved building as an entrance to the West-Kruiskade, where nowadays Bram Ladage and Ayla are located, and a higher flat, perpendicular to the office buildings. The design is modern, with light colours and sleek facades. Also the layout is special with a lot of variation in type of living arrangements. Residents have their own room and share a shared living room, kitchen and shower. Because the rooms were flexible to set up, the size could be adjusted to the wishes of the residents. On the roof is a shared terrace with a beautiful view on the city.